Due to on going mobile posting issues, as well as better functionality and features elsewhere, we'll be migrating over to in the coming week. I will share the new address when migration is complete! I will leave existing posts here for those who've shared on Twitter, Facebook or Pinterest, as well as import them to the new site. All future posts will appear at the new location. Along with improved features for "Life Down on the Farm", I'll be adding an Etsy shop exclusive companion blog/site, too! Thanks for your continued support, it's really appreciated! 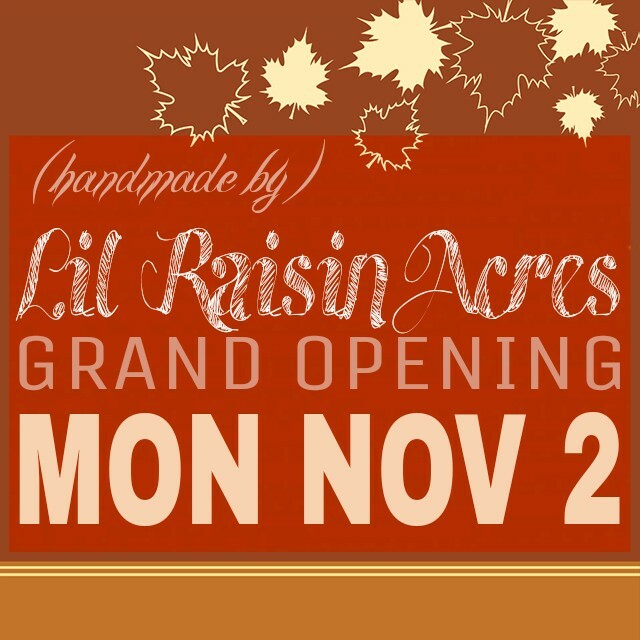 My Etsy Shop will be opening Monday, November 2. Please stay tuned for further details! I have been busily working on setting up "Lil Raisin Acres" as a legally recognized entity, and producing stock for online sales! I have not set an official opening date, although it will be before the end of the year! I will be offering fashion accessories, novelty and seasonal accessories and decorative items, and perhaps occasionally jewelry items made by Britt and handcrafted wood items from my father. Stay tuned for a Grand Opening Announcement SOON!